Highlights and pitfalls of opening your own brick and mortar shop. Plus, bring on the nitty-gritty SEO education! I wouldn't call this idea crazy, but will require careful planning so you don't do something crazy. Opening a shop is certainly a challenging commitment whether it's on the street or online. I see two major issues: time and money. First, it's essential that you create a business plan and a carefully crafted annual budget. Search online for information about writing a business plan before you do anything else. You have all the information you'll need to build a projected budget that includes expenses--both fixed and variable. Fixed expenses include rent, insurance, supplies, and utilities--they're the easy ones. Then there are the variables, which include merchandise (yes merchandise, as the shop will be purchasing your work to sell), staff, and promotions. Those are the biggies when it comes to variables. Since you have no history to refer to, you'll be dealing with these expenses on a totally subjective basis. I'd suggest you estimate on the high side, as it is better to have a surplus rather than a deficit at the end of the year. Secondly, you have to project your sales. This is tough without any history to rely on, so let's try to work both ends to the middle. For this example, I'm going to set the monthly fixed expenses at $5,000. This means you'd need $5,000 in sales just to keep the space open for business. To budget for variable expenses, you'll have to decide how many hours each month you'll work in the store and how many hours will be covered by an employee. The promotions budget typically fluctuates within the sales curve, wherein you'd spend more during anticipated bigger sales months. If we add another $5,000 for variables, the break even figure is now $10,000. Here comes the potential deal breaker or plan changer: can you run a shop and make enough jewelry to provide the inventory needed to make the sales projections you need to in order to pay the bills? Only you can answer this one. Whatever your answer is, I'd suggest you consider selling the work of other jewelers and not just your own work. This will do two things: take the production press off you and offer your shoppers a broader selection of merchandise--always a plus for any shop. I'm aware of craftspeople who have opened shops thinking they could simultaneously make and sell. Most couldn't and needed to choose a direction one way or the other. If this happens to you, you'll want to make the choice that won't make you crazy. Just as your perfectly crafted object will not be seen by enough eyes if it's not promoted well, the same is true of your website. Since Google is practically synonymous with ''search engine,'' we view SEO as doing everything we can to put our clients at the top of Google's search results. We call it developing your ''web presence,'' which includes your website and everything that leads to and from it. Knowing what Google uses to calculate your Search Engine Ranking Placement, or SERP, is the key to higher ranking and better quality traffic. Google is looking for and weighing ''trust factors''--the things that validate your business and website, which include consistency, popularity, relevance, and authority. Your business's name, address, and phone must be consistent wherever it's listed. Your overall web popularity and site popularity shows the value of what you're sharing as indicated by your traffic and keyword search results, social signals, and reviews. If your content is relevant to your business you'll have Google's trust. Your popularity and relevance validate your authority, or recognition as a leader in your industry or field. 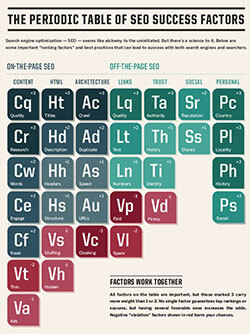 Google only uses about 25 percent of the trust factors that are on your website for its formula. They get the other 75 percent of your business's validation from directory listings, social media channels, and other websites. Claim Google My Business profile, fully fill out the profile, and verify it (by postcard). Claim or create your Google+ page and build a network. Focus on quality and relevance rather than frequency. Create a YouTube account and post at least a little video of your portfolio slide show. Create an analytics account and add the tracking code to your website so you can compare visitor data before and after your SEO efforts. Create a Webmaster Account, and link to your analytics account to get keyword statistics. Next, claim directory listings on Bing, Yahoo Local, DMOZ.org, Merchant Circle, Yelp, and Manta. Steer clear of listing services like Yext and LocalSplash, as the gains you might make could disappear if you end your subscription. After that, create inbound links from relevant sites like galleries, stores, agents, and media driven industry associations like NCECA or American Craft Council. Reciprocal links (when you link to them) engender even more trust. Inbound links from popular artisan shopping sites are valuable. Listing a few items will be enough to establish a presence. If you've got a few minutes every day, post or share pictures and videos on the visual social media channel(s) where and when your target audience hang out. As for the 25 percent of information on your website, if the site design and usability are OK, best practices are really all you need for ''on-page SEO'': use one keyword per page, repeat it verbatim in the file name, page title, description, heading tags, images, internal links, and a few times in a page of quality content. Now you have a full plate and a road map to use with your web designer/master. Donald Clark is the author of Making a Living in Crafts and was a partner in Ferrin Gallery for 25 years. In addition to writing, he is currently a consultant to artists, a personal property appraiser, and a collection manager. He also continues to create his constructions that have been shown extensively and collected internationally.